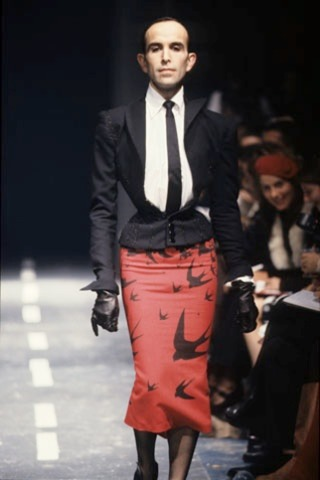 Ensemble, Alexander McQueen, The Birds, S/S 1995. Model: Mr. Pearl. "This definitive publication on Alexander McQueen (1969 - 2010) invites you into the creative mind of one of Britain's most brilliant, daring and provocative designers. Accompanying the V&A's landmark exhibition Alexander McQueen: Savage Beauty, this comprehensive catalogue features 28 ground-breaking essays from expert fashion commentators and cultural scholars which examine the richness and complexity of McQueen’s visionary fashion."